The Oregon Native American Chamber (ONAC) invites you to join us as we hold our 13th Annual Gathering event, “Opportunity in Community” at the Exchange Ballroom in Portland, Oregon. The Annual Gathering, ONAC’s signature event, is a unique opportunity for members, partners, and the Native business community to network, celebrate, and support the work of ONAC and its scholarship program. Each year, the Gathering brings together Tribal representatives, corporate partners, city, county, and state government agencies and community leaders to celebrate the contributions of ONAC members and the Native American business community. Louie Gong, M.Ed. (Nooksack) is a self-taught artist and entrepreneur who is widely recognized for his contemporary Coast Salish artwork and groundbreaking business practices established through Eighth Generation, a company he started in 2008 as a way to sell the shoes he was customizing with cultural art. In 2015, Eighth Generation became the first Native-owned company to offer wool blankets. In 2016, it opened flagship store in Seattle’s iconic Pike Place Market. The business’ popularity is driven by its high levels of community engagement and robust donation record, both indicative of Louie’s roots in education and non-profit leadership. Eighth Generation’s Inspired Natives Project, anchored by the tagline “Inspired Natives, not Native-inspired”, has proven effective at building business capacity among cultural artists while addressing the economic impact of cultural appropriation. Louie’s work has been featured in MSNBC, NBC Nightly News, NPR and nearly 100 other major news media. 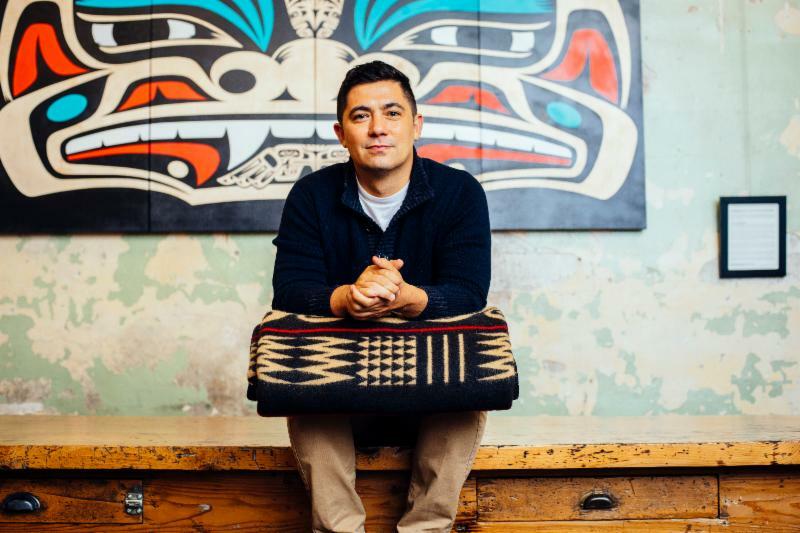 He has been honored to be included in Native Max Magazine’s list of ” Top 10 Inspirational Natives: Past and Present” (2013), Indian Country Today’s “Faces of Indian Country” (2015) and named as a finalist for Seattle’s 2016 Mayor’s Arts Award. ONAC’s work has been guided by the belief that Native businesses are a foundation for emerging Native economies that would provide employment and educational opportunities and allow our Native communities the opportunity to break the generational cycles of poverty. Today we carry that belief forward and continue to work toward a brighter future with a thriving and connected Native American community that empowers its business leaders with resources, partnerships, and services that ensure their success and supports the educational aspirations of community members. By supporting and attending the 13th Annual Gathering, you helped provide critical support to advance ONAC’s mission and provide ongoing scholarship support to outstanding Native American College students. Each year ONAC leverages the financial and in-kind support of small businesses, nonprofit organizations, corporate partners, members, and individuals to host the Annual Gathering. We would not be able to host this event without the ongoing support of our partners and sponsors that help advance ONAC’s mission and provide the resources to support outstanding Native American college students. We hope you will join us and support the only event that celebrates the Native American business community. In addition to the event sponsorship opportunities, you can also support the 13th Annual Gathering in the following ways. Scholarship Sponsorship. Every year ONAC works with the community to identify, select and award up to 10 scholarships. Each year individuals, businesses, and corporations step up to sponsor the $1,500+ scholarships we award to outstanding Native American college students that represent the next generation of leaders. Staging and assisting with the Silent Auction and event coordination tasks. All volunteers are greatly appreciated and will be recognized in our program for their contribution. Host a special pre-gathering reception to meet ONAC’s Scholarship and Warrior Award recipients. Reserved table for ten (10) and recognition in Annual Gathering event program. Reserved table for five (5) and recognition in Annual Gathering event program.